Sale-a-bration starts and you are going to LOVE LOVE all the items you can earn for free. Stampin' Up! really has outdone themselves this year. I have to say I want to earn them all this year. This is the perfect time to get those amazing Blendabilites that have released, stock up on card stock, adhesive. Everytime you make a 50$ purchase you get free products! Here is the Epic Celebrations stamp set. Guitar, headphones and converse sneakers. 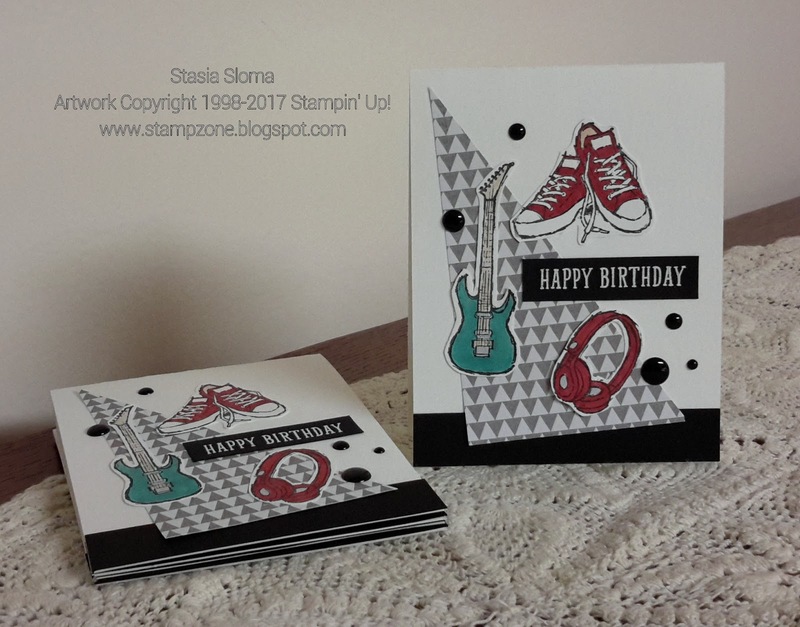 Perfect card for teens, music lovers and masculine cards. I added the sentiment from the retired B.Y.O.B. stamp set and heat embossed it. The images were colored in with my Blendabilites and Copic markers. The paper and the enamel dots were from craft stash.